I saw some good recipes that I will have to try. I would like to can some spaghetti sauce. I have used the packets before but I would really like something w/ less sodium. Do you have a recipe that you use? I don’t have one but I know mom does, I will try and get her to post it! Soon I am going to have to quit my job so I can go to school full time for my final year (For my Master’s Degree) My husband is worried about bills getting paid, I am worried about paying for food. We live on a small island in Alaska, so the only time I purchase in bulk is when the stores have something on a massive sale. (Like the time I purchased 15 lbs of cherries for the extremly cheap price of 20$, so you can see how expensive it is to live here) I want to start stocking the pantry and freezer with home made preserved foods, but the main problem is… I’ve always either cooked from fresh or frozen. When I pull something from a can, I pour it in a cup or on the plate and use it. See: Canned Corn, Canned Green Beans, Canned Peaches. Even Canned Broth I can figure out. 🙂 Is there any way you can use examples of ways to use the things you are teaching us to make? I don’t think I will ever look in my pantry and say: oh, hey, Frozen Kale or Canned Oranges, perfect! I know just what to do with this! LOL!!! All of that being said, I love your website, and I’m working at putting away freezer meals (for nights when I have school) and a few simple canned goods, thanks to you! 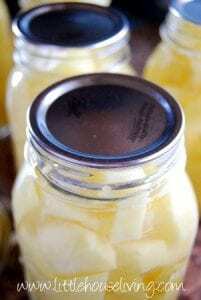 Is apple juice a canning possibility also? I love juice I didn’t even think about canning that. Do you keep it in the fridge or freezer and what is the shelf life on juices? You can can up most kinds of juice! I would recommend getting the book, Putting Food By to find out exact methods and times. The shelf life on most canned foods is at least 2-3 years and once it’s canned it does not need to be kept in a fridge or freezer. I have a question. I canned some salsa last night but just realized this morning that I forgot the vinegar. Should I do them over or leave them? It should be fine as long as it was canned for the proper mount of time. NO…..it is NOT OK at all. You have to have a certain amount of acidity (vinegar or lemon or lime) juice when doing salsa. Please check into the Ball Blue Book or call your local extension office. I am new to canning, even though my mom did it all the time. Do you have a favorite canning cookbook for recipes? I have had Putting Foods By for many years thanks to my mom.Awesome book. I just love this site. I feel so at home! Have just registered as an affiliate to promote your book. I love this site, I have gotten so many ideas and recipes from here. Great site answers many questions I have had in the past about lots of interesting posts. Thanks for sharing. Do you have a FB web site? I OWN YOU PICK ORGANIC ORCHARD NORTH OF TUCSON, AZ. WOULD LOVE TO LEARD MORE ABOUT YOURSIE. Hello I was wondering if anyone had some good ideas or recipes for dehydrating fruit and jerky? I have never dehydrated anything before so any help or suggestions would be much appreciated. Thank you! I’m not sure I have much on here yet for dehydrating fruit but I do have this article for Dehydrating Vegetables and The Best Beef Jerky Recipe! Hi Mine was a live and learn with jerky. I made up four different marinades with various spices. Worchestershire Sauce, brown sugar and some salt are staples of jerky. But you can do just about anything. I made up four mixtures marinated them and then let my family judge (I don’t eat jerky but love making it) They picked the recipe that had the spice mix I get at a farmers market and don’t know what is in it. 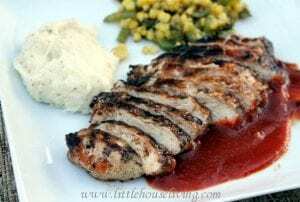 So your best bet is small recipes of marinade and make a variety to see what you like best. I labeled them 1,2,3,4 and kept them seperate. Worked great and now my kids hate the store bought kind. Thank You for your site. I live in an apartment with my husband. Even though I’ve done lots of canning in the past for the last several years I’ve been branching out with different veggies and fruits. This year it’s the sweet potato. My husband likes sweet potato pie along with candied sweet potatoes. I like them just baked with a little butter. We live on a limited budget and attend the local food pantries to help with our needs. I don’t like to waste so I find that canning helps me save money and allows me to put food up in the amount we need per meal. Thank You again for the help your site has given me. I was wondering what the canning process is for canning the bbq sauce recipe you have on here is. Also how much does your recipe make? I would like to make about 12 half pints or so. Thank you for your help. I really enjoy your blog. This is a wonderful website! I found it through Pintrest. I love the homey atmosphere it has, he recipes and pictures are great! It’s always great to see people living on the more simple side of life! i’ll be back o the site to check more out again! thanks for making this for everyone to see! Welcome to our little community Monica! I just found your website today. This is exactly how I want to live. I spent quite a bit of time last Summer with the Amish Community. They certainly are living a loving, christian, family life. I learned so much from spending time with some of the families. I purchased vegetables from them and asked canning questions. I am currently working on enlarging my own garden. I want to add a greenhouse. I’ve gone back to baking and cooking meals as much as possible. I also am cutting down on using electric appliances. Most of my baking tools are hand operated and have been purchased from garage/ estate sales. The older the better. Hello Merissa, I have just found your website today and this how we would like to live. You have created a very homey and safe place to come and visit. I would like to try my hand at some of your recipes. 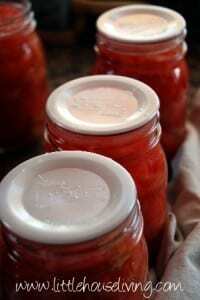 I am very new to the canning and preserving recipes and don’t know the first thing about how to do it or what I would need. My husband and I had just moved from the city to a small house on an acre of property and would like to start a small garden but we don’t know what we are doing. Lol Thank you so much for sharing your recipes with all of us. Take care and have a wonderful and blessed day. Been trying to find a recipe for Blueberries and how to freeze/can/make for pies, ect…cannot find anything!! Please help!! LOVE your cite here…have used the Cheeseburger Hamburger helper MANY times…kids LOVE it, and the seasoned salt, and many of your freezer methods for veggies…Thank you so much for being here for all of us!! I have been wanting to learn how to can for a long time. I spoke to each of my grandmothers who canned a lot when they were younger. They told me they boil their lids and jars and then fill the jar with the jam and put the hot lid on to seal the jar and let sit. They do not use a pressure cooker or water bath. Is it okay to can the way they did it? Thanks! 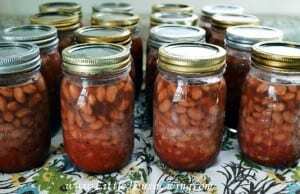 This type of canning was pretty common not very long ago (my grandma did it as well) but it’s no longer considered safe. Hi, I am married to an Italian. A friend requested my husband to make creamy pesto sauce for Christmas giveaways. She gave us jars to put the pesto in. . How do we preserve it inside the jars . Is it safe ? It isn’t considered safe to can pesto sauce because of the oil in the recipe, sorry! Maybe you could give the gift recipients the dry ingredients for the recipe? A previous poster asked about canning apple juice. I’ve been doing it for many years. I cut up my apples into quarters and put them in a plastic 5 gallon pail ( I make a lot of juice). I don’t core them or remove stems etc. I just wash them. I have my own apple tree so I don’t have to worry about chemicals. I then cover the apples with boiling water and let them sit for a day (approx. 24 hours). I then strain them first in a colander. I take the strained juice and strain it again through a jelly cloth bag. I heat the juice, add sugar to taste (I make it in a large stock sized pot and add approximately 1 cup sugar) and a splash of lemon juice. Just cool some and taste to see if you have put in enough sugar. Once it boils I bottle it and then can it for 20 minutes. I have never had a bottle of juice spoil. It will last two to three years. 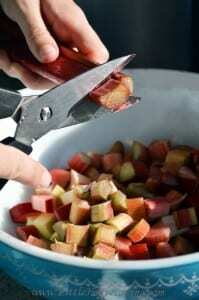 Some times I add raspberry juice if I have some (no seeds) to give it colour and flavour. I have made up to 50 quart sized bottles if my apples are plentiful. Thanks for lovely recipes. On the Beef jerky here in RSA we make what we call biltong. basically you place the meat in a tub sprinkle salt, coriander and pepper over it with a little vinegar. then let it stand over night and hang to dry the next day. I have a mesh shelf under a ceiling fan that works like a dream. 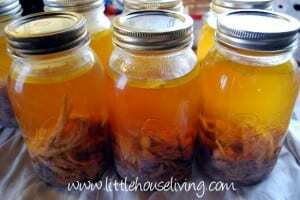 Was just wondering if anyone has canned rendered lard ,and if they could post the method they used.